Title Card: “Why Am I in Cuba?” Cue PBS/American Experience Dolorous Male Narrator (hereafter: PBSAEDMN) who will, as “Josephine’s Waltz” or some other Irish/Appalachian fiddle lament (hey, maybe the Dixie Chicks) plays in the background, and the camera pans over photos like this and this and this, recount how America, a country founded on the principal of human rights and due process and freedom from tyranny, descended into a pit of barbarity, best exemplified by our treatment of prisoners unlawfully held at Guantanamo Bay. The PBSAEDMN will explain—along with a gray-haired Michael Beschloss and perhaps an apologetic Peter Beinart or Fareed Zakaria and a still aghast Frank Rich—how the impulse that led to their detentions, their treatment, their lack of legal recourse was perhaps understandable, given how traumatized the nation was after 9/11. The Iraq War; the rush to judgment against Jose Padilla, John Walker Lind, and dozens more U.S. citizens; the enemy combatant limbo imposed upon foreign nationals; the warrantless wiretapping and other corrosions of civil liberties—all these things were supported by good people, smart people, people who went to Harvard. 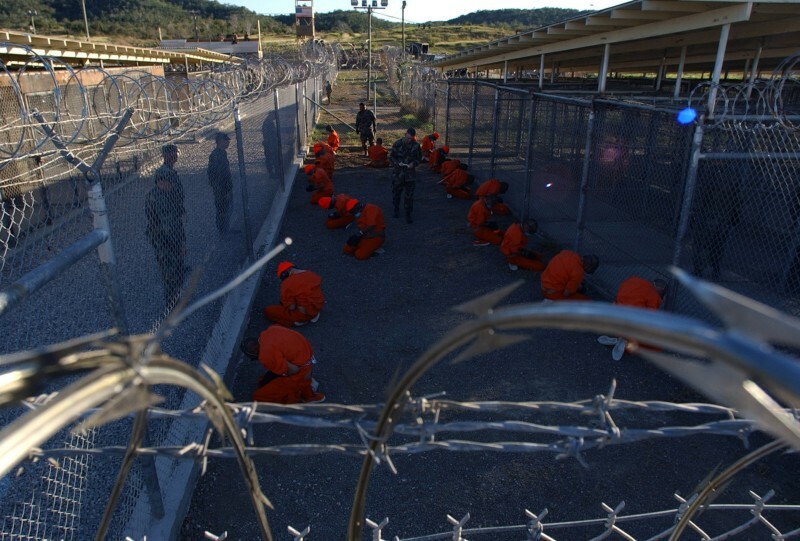 But then, the PBSAEDMN will explain, the truth about Guantanamo was slowly revealed. The underage prisoners. The chicken farmers sent there because of a bureaucratic mistake or tribal infighting. The torture. The desecration of the Koran. The female guards pretending to smear prisoners with menstrual blood. The rampant depression, psychic breaks, hunger strikes, and suicide attempts—successful and otherwise. The fact that hundreds of prisoners were found to have been misidentified or of “no threat” to the United States (which is to say: innocent). As the utter miscarriage of justice that was Guantanamo became apparent to the American people and the rest of the world (which was fairly convinced all along) gradually, the PBSAEDMN and various talking heads will explain, the military began to loosen up. Prisoners were divided into population groups depending on their perceived risk and behavior, and scores of non-violent, non-threatening chicken farmers and pencil sellers and taxi drivers and stand-up comedians were quietly released. It seemed, for a while, that some small measure of sanity was creeping into our Guantanamo policy. But then, in mid December, came news, via the New York Times, that new Gitmo commander Rear Admiral Harry B. Harris—the man who in June told Nightline that, despite all evidence to the contrary, “I believe truly that I am holding no innocent men in Guantanamo” and called the simultaneous suicides of three inmates to be “an act of asymmetric warfare“—had decided that the real problem at Gitmo was that the prisoners had it too easy. Security procedures have been tightened. Group activities have been scaled back. With the retrofitting of Camp 6 and the near-emptying of another showcase camp for compliant prisoners, military officials said about three-fourths of the detainees would eventually be held in maximum-security cells. That is a stark departure from earlier plans to hold a similar number in medium-security units. Officials said the shift reflected the military’s analysis — after a series of hunger strikes, a riot last May and three suicides by detainees in June — that earlier efforts to ease restrictions on the detainees had gone too far.